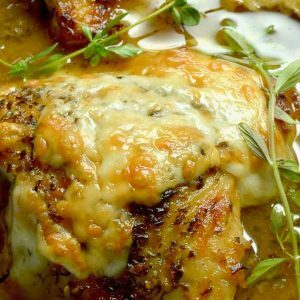 French Onion Chicken: caramelized onions under melted gooey cheese all atop braised tender chicken with a French onion style sauce. An excellent option for dinner with friends, but your family will want it for a weeknight dinner option! French Onion Chicken is a twist on French onion Soup….. made with all the things you love about French Onion Soup but made into a main course meal by adding a succulent herb crusted piece of chicken. This recipe for French onion chicken came about because I was craving soup. It’s been super hot so the thought of eating soup in this weather was not appealing. But I do love melty caramelized cheese with crazy flavorful onions so this worked for a nice filling meal. On a side note, if you want to make French Onion Soup I highly recommend using Julia Child’s recipe which you can see her actually make in this video here! She is the QUEEN of all things delicious! 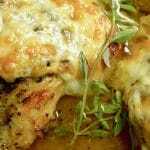 Want to see just how easy this French Onion Chicken Recipe is? Be sure and check out the video down below by the recipe! When making French Onion Chicken the most critical thing in making it is getting the onions right. You need to cook a lot of them and cook them really slow. Cut the onions, evenly paying special attention to not having them be too thin. At the smallest cut them 1/8 ” wide. I cut mine 1/4″ because I don’t want so many of them to dissolve. If you cut them unevenly or too small they tend to burn in some parts. Cook the onions on low and for a long period of time to let the flavor develop. If you cook them too fast, they get burnt and don’t soften to the consistency that works best for this recipe. Be Patient. You’ll want to turn the heat up and cook the onions faster, but to get a deep rich brown color you will need to keep the low temperature and use the whole 45 minutes to cook the onions. When you taste the deep, rich flavor in the first bite of the French Onion Chicken you will understand why. What kind of chicken works with this chicken recipe? I used chicken thighs but it would be successful with any chicken at all. In the past Ive used breasts which worked really well. Can you use skinless chicken? Yes. You’ll want to be careful when browning the chicken to not cook them too long. I dont recommend skipping the browning, but I would cut the time down then allow the chicken to cook in the sauce a little bit longer! Chicken with the skin on usually has a lot more flavor. In this recipe you wont miss out on any flavor because of everything else that is included in the recipe! Make Ahead? Not with this recipe. It works much better making it right before serving it. Serving suggestions: This is a delicious meal that is ideal for entertaining. You can cook the onions before the guests arrive and pop it in the oven to cook while you are enjoying some appetizers. Once the dish is in the oven all that’s left is to place the cheese on in the last 10 mins so its very hands off once it’s in the oven. Low sided everyday pan like these pictured here. The low sides help with braising the chicken. As a bonus, you can make the dish all in one pan. You would need to take the onions out while you brown the chicken, but all in all its only one pan to cook in! I use a box grater regularly like these here. I like that this box grater has different choices for different recipes so it’s one utensil with several options. Looking for other comfort food meals to serve dinner guests? Pin this to your Special Occasion Meals for Entertaining on Pinterest! Lets Be Friends …. follow me on Pinterest for more ideas for stress free entertaining with confidence! Place 2 tablespoons olive oil in pan and heat to medium-low. Add onions and cook until the onions are a deep rich brown color. About 45 minutes. DO NOT TURN THE HEAT TO HIGH to cook it faster. You may need to add a tablespoon of broth occasionally if you see the onions sticking. The onions will reduce down a lot. Don't worry. Its what is supposed to happen. Once the onions are nice and browned, add garlic, thyme and flour to onions and stir vigorously to combine. Continue to cook for 3 minutes. Then add half of the broth and stir and cook for 5 minutes. Then scoop out 1/3 of the onions and place on a plate. Add the rest of the broth, balsamic vinegar, mustard and Worcestershire sauce and bring to a boil. (And the deglazed juices from cooking the chicken) The sauce should start to thicken in a few minutes. Serve Immediately. Serving suggestions: serve over rice, pasta, gnocchi. Serve along French bread slices to soak up the sauce. Delicious! This sounds like a future new dinner favorite! Simple enough for a weeknight dinner, yet also special enough to serve to guests! A real all-rounder! Can anyone give me the instructions for a using a crockpot to cook the onions using this recipe. Especially when to add the seasonings…flour etc?? Hi Judy…. I threw a bunch of cut onions… (I cooked way more than I would need for this recipe) into my crockpot on low with one tablespoon of butter. Stirred it once the butter was melted and left it all day while I was out. 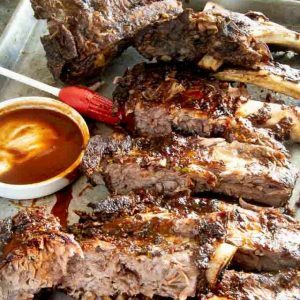 When I got home I stored them in my fridge until the next day when I needed them for this recipe. When I went to make the recipe I scooped out what I was going to use for this recipe and warmed them in the skillet — once they were hot I added the flour and went about the recipe as listed. Thank you so much. Perfect meal on a cooler day. I covered the chicken when I put it in the oven for extra soupy-ness and did it with garlic mash and herb. My man loved it too. Can I use mozzarella or smoked provolone, instead of the Gouda or the gruyere? Made this as a first recipe in my new Lodge enameled Dutch Oven. It was unbelievable… The family loved loved loved it! The crowd was screaming for a nice French bread to accompany the dish. I love this recipe. Served it with rice and roasted asparagus. Yum, Yum, Yum! Will be doing this one many times. This is TOPS on my must make list!! What a great recipe!! I am a French Onion Soup fanatic and I love your spin on this timeless classic. We are having an exceptionally cold January and this warm and comforting dish looks like a perfect dinner solution for sometime this week. Thanks for the delicious inspiration! Oh my goodness that chicken looks delicious! The pan sauce with it? I need this and a big slice of bread for this meal. Fabulous!!! That looks amazing! Much better than the recipe I’ve been working on. Can’t wait to try this one. Oh, this looks fantastic! I’m always looking for new chicken recipes. Looking forward to this one! This recipe sounds absolutely divine! I love French on soup, so I know I would love this! I made this last night and it was fabulous! I cut a few corners, just because I didn’t make it for the blog, it was just for my husband! But I used all of the ingredients and didn’t worry about presentation. I don’t understand the vinegar? But the chicken was outstanding. And then the kitchen smelled like Gruyere! Thanks! Did you use bone in chicken? Yummy. I found the best tip for doing the onions though. Fill the crock pot. A splash of olive oil the thyme and garlic. Cook on low all day. By dinner just need to finish it up the same as the recipe. Onions are perfect. Cuts the after work time in half. 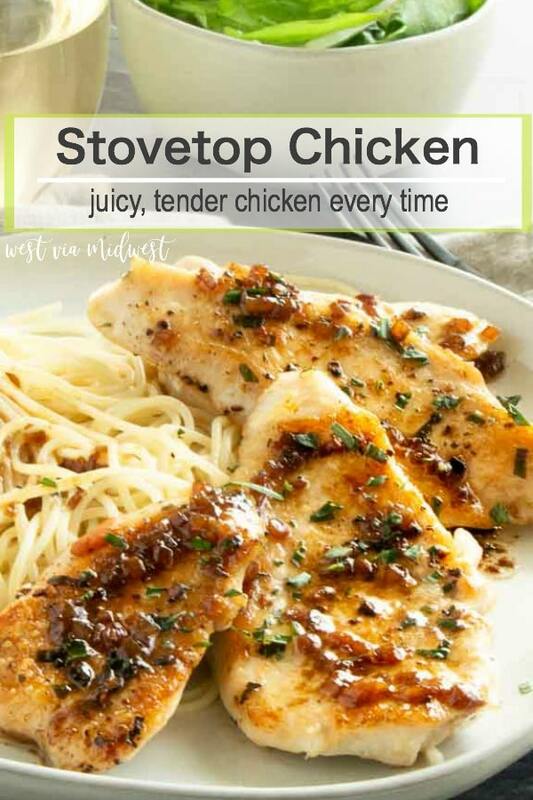 This is so delicious and the chicken is super moist and tender! I made it last night and served it in small cassoulet dishes. I did follow the crock pot recommendation and the onions were beautifully caramelized! I am going to double the onions next time! Huge hit, even for the dog who sneaked half of the grated cheese off of the counter! This looks terrific! Can’t wait to try it. Regarding the thyme, did you use fresh or dried? I’m thinking dried since it’s a small amount. If it is, can I use fresh instead, and how much would you use? Thank you Lindsey, for making it and taking the time to tell me you enjoyed it! 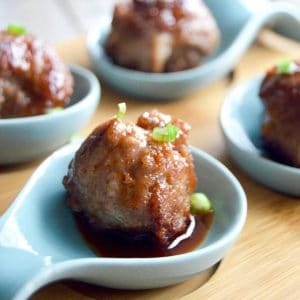 Im trying something similar today with a pork chop, if it comes out even half as good as the chicken did I’ll be happy! ~michele! What other part of the chicken can I use for this, I’m not a thigh person. I would like to try this, it looks really good. So delicious, and worth the wait! My family loved it. I paired it with an orzo pasta side dish and green beans. Thanks for this recipe. I’ll be making it again in the future! This looks like TOTAL comfort food – wow!! I can’t wait to try this recipe. I am drooling over here! Oh, this looks delicious! I love to cook with chicken and I can’t wait to try this yummy recipe! Your photos actually made my mouth water! Mouthwatering recipes are a the best! :). And this is the time of year for it – the freshest onions caramelize the best, I find! I love everything about this dish. It’s the perfect comfort food and I love the chicken twist! I need to try this! I am always standing in the kitchen so I don’t have a problem with this cooking for a long time if I can remind myself not to put the burner on high LOL. Always looking for a new chicken recipe! Sounds delicious and will give it a try. Step 3 of the instructions instruct to add garlic, however, the ingredient list does not indicate how much. Also, does this recipe work if I cut in half? 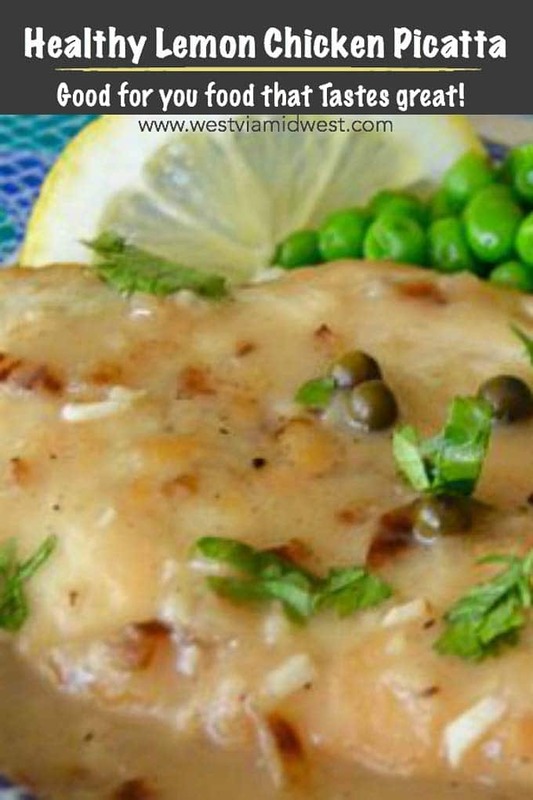 I love the idea of french onion chicken! What a great combination. 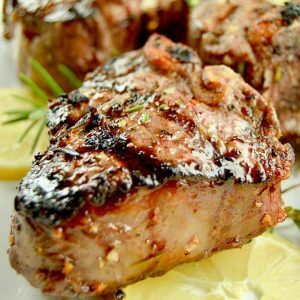 It sounds like the perfect meal to serve to guests and with only 15 min prep you can’t go wrong! You ended up making me click on that Julia Child video and I spent the entire 30 minutes marveling at the old fashioned cooking show business! 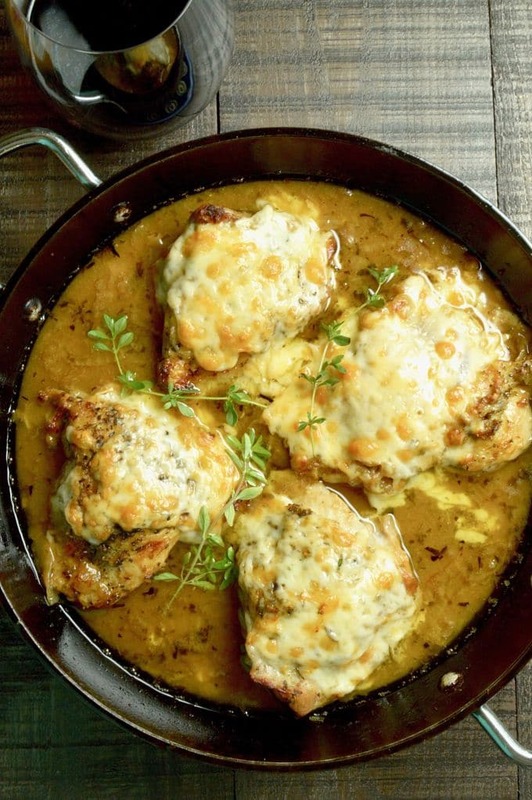 This French onion chicken looks absolutely delicious and I can’t wait to give it a try. This is perfection! 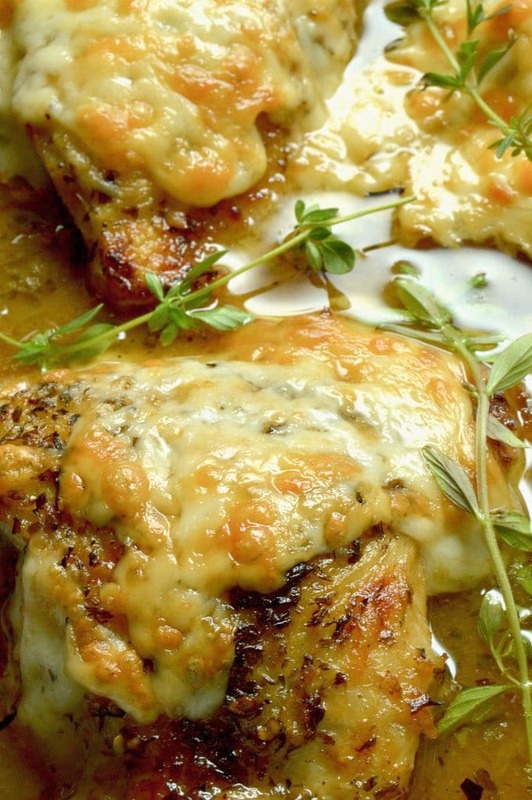 I absolutely love the idea of cooking chicken with French Onion Soup- DELICIOUS! Oh, holy moly! This looks so amazing and delicious!!! Um, yes please?!?!?!?! 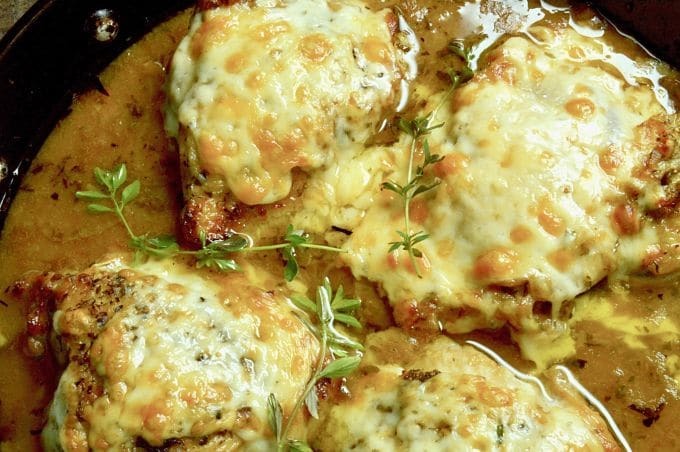 French onion is one of my favorite flavors and this chicken with that thick layer of cheese looks and sounds absolutely amazing!